Artists: Adam Brent, Elizabeth Bryant, Nicole Cohen, Ori Gersht, Jessica Jackson Hutchins, Sue Johnson, Laura Letinsky, Beth Lipman, Erin O’Keefe, Donna Sharrett, Nicolas Touron, Michael Vahrenwald, Rodrigo Valenzuela and Alex Verhaest. (Not So) Still Life presents novel ways that contemporary artists are transforming the still life genre to engage with current culture. As a subject, the still life gained popularity in the Early Renaissance as an alternative to landscape, portraiture or religious subjects. Compositions of natural and inanimate objects were often presented with allegorical connotations. Today, artists are creating new variations by working in photography and sculpture to conflate interior space with landscape, or by using video and animation to convey still life in motion. Several artists will be creating new works that respond to the domestic interior of Glyndor Gallery, once a private home. To reactivate the genre, several artists are looking directly at historic paintings. In a new site-specific work, Nicole Cohen creates a video overlay of an animation of 18th century Dutch master Jan van Huysum’s, Fruit Piece (1722), on an image of a gallery window with a view of the Hudson River that brings to life the changing and rebirth of seasons rendered in the Dutch masterpiece.Ori Gersht’s photographs On Reflection capture the split-second moments of creation in destruction of exploding mirrors reflecting faithfully recreated floral arrangements based on paintings by Jan Brueghel the Elder. Michael Vahrenwald’s photographs from his series, Forest Floor (after Otto Marseus van Schrieck), capture found still lifes on sidewalks in Brooklyn’s industrial areas, in a nod to the paintings of 17th century Dutch botanist and entomologist Otto Marseus van Schrieck. Alex VerhaestTemps Mort: Table Props reference the vanitas imagery of Pieter Claesz and Willem Claesz Heda, while combining contemporary technology and classical themes to recreate visual narratives. Other artists are using materials such as ceramic, glass or fabric to create vignettes to probe memory, ephemerality and other concerns of the traditional still life genre. Nicolas Touron sets porcelain-cast cicada carapaces in a miniature porcelain terrain composed like a still life and containing a projection of macro greenhouse footage that conjures memories of natural landscapes. Beth Lipman’s hand-sculpted crystalline installation reflects modern-day notions of mortality, consumerism, materiality, fragility, and temporality. Laura Letinsky’s candid photographs of tabletop remnants allude to human presence in tension between ripeness and decay, fertility and void, familiarity and distance. Adam Brent creates whimsical domestic assemblages modeled on narratives of personal history, place, and memory via 3D scanning and printing technologies. Donna Sharrett deconstructs and reconstructs worn items of deceased loved ones through meticulous handiwork of sewing, stitching, quilting and embroidering particular elements intomomento mori textile mandalas. Sue Johnson recreates the “American Dream” on a dining table featuring both printed imagery and ceramic objects through traditions of vanitas and trompe l’oeil, in an investigation of material culture contextualized within ideals of the postwar suburban home. A number of other artists in the exhibition utilize the illusionistic techniques of trompe l’oeil (trick the eye) to break the boundary between two and three-dimensional space. Elizabeth Bryant’s photographic tableaus feature found objects, magazine clippings and live plants in spatial arrangements that create complex and often humorous hybrid forms. Grounded in the history of photography as well as architecture, Erin O’Keefe’s photographs consider the layers of distortion and optical illusion generated from the transformation of complex arrangements in three dimensional space into two dimensional image plane. In further dialogue with the use of spatial effects in themes of still life, photographs from Rodrigo Valenzuela’s Still Life series explore the way images, such as landscapes and tableaus, are inhabited and the ways in which space, objects and the natural world are translated into images. 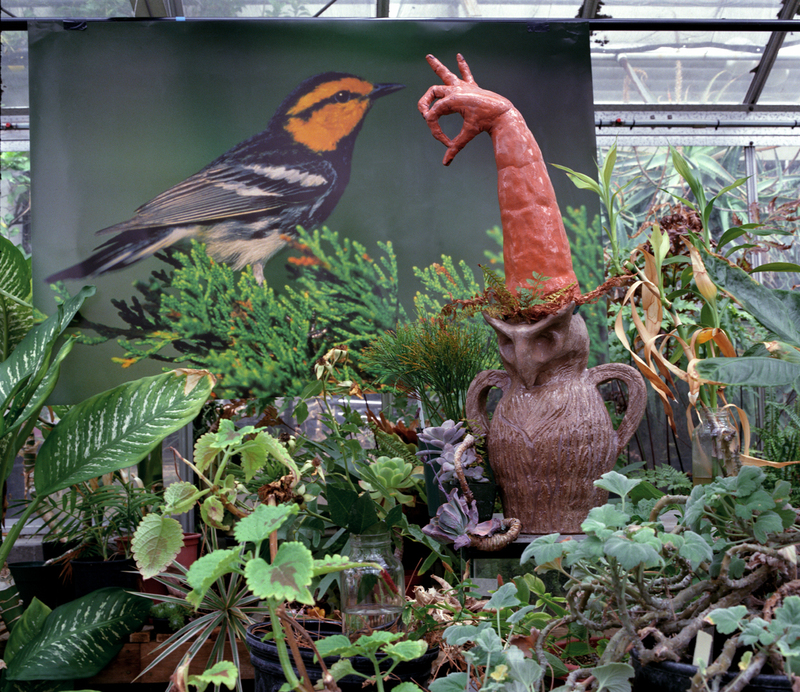 Elizabeth Bryant, Greenhouse/Golden Cheeked Warbler, 2012, archival inkjet print, 34” x 40”. Courtesy of the artist.